Julia Glass, the bestselling, National Book Award-winning author of Three Junes, returns with a tender, riveting book of two sisters and their complicated relationship. Louisa Jardine is the older one, the conscientious student, precise and careful: the one who yearns for a good marriage, an artistic career, a family. Clem, the archetypal youngest, is the rebel: committed to her work saving animals, but not to the men who fall for her. In this vivid, heartrending story of what we can and cannot do for those we love, the sisters grow closer as they move further apart. 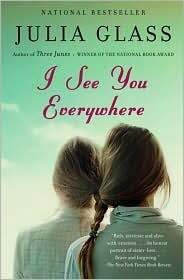 All told with sensual detail and deft characterization, I See You Everywhere is a candid story of life and death, companionship and sorrow, and the nature of sisterhood itself. Julia Glass is the author of Three Junes, which won the National Book Award for Fiction, and The Whole World Over. She has received fellowships from the National Endowment for the Arts, the New York Foundation for the Arts, and the Radcliffe Institute for Advanced Study. Her short fiction has won several prizes, including the Tobias Wolff Award and the Pirate’s Alley Faulkner Society Medal for the Best Novella. She lives with her family in Massachusetts. I See You Everywhere focuses on the relationship of Louisa and Clement Jardine. Describe each sister’s character. How are they like and unlike each other-also, like and unlike their parents? What do their attitudes toward work, love, and family have in common? How do they differ? Especially at the beginning, Louisa’s sense of her own identity depends largely on her relationship to art-her pottery and writing; later on, her work with other artists as an editor and a gallery director. What does this say about Louisa? In “Coat of Many Colors,” why does Esteban’s knitting speak so deeply to her? And later, in “The World We Made,” what does Clem and Louisa’s conversation about Eva Hesse’s art-about what lasts and what is fleeting-illuminate about the way each woman sees the world? The story of these sisters begins at the end of someone else’s story-Aunt Lucy’s. In fact, you could see it as the story about another set of sisters. How does this section relate to the others that follow, and what dynamic does it create between Clem and Louisa? And what is the significance, throughout the book, of Lucy’s enormous, well-kept secret? What role do secrets play throughout, especially in Clem’s life? Glass has chosen to tell this story through alternating perspectives and, from both sides, in first person. How does this affect your reading? How do you relate to both sisters and see them differently than perhaps they are able to see each other? Take a look at the different subtitles-from “Swim to the Middle” to “The Last Word.” What do they add, if anything, to your reading of the larger story? Letter writing plays an important part in several sections (e.g., the letters Clem and Louisa write to each other, Clem’s letters to Ralph, the letters Louisa finds from a high-school friend in an old box). How does letter writing create a different relationship between two people than e-mail does? Does a separate sense of Clem as a person emerge in her letters? What does it mean that Clem chooses R.B. as the recipient of her final, most significant letter? Read through that letter again. Do you think it has the impact she intended on those who will see it? Do you think she suspected that R.B. would not keep it to himself? Does the letter change the way you saw and felt about her up to this point in the book? Cooking is meaningful in all of Glass’s fiction. What role does it play in this book? From the beginning, Clem acknowledges that she is her parents’ favorite and feels this places a burden on her: “Every expectation you fulfill…puts you one step higher and closer to that Grand Canyon rim from which you could one day rule the world-or plummet in very grand style.” How does this feeling of expectation influence the way Clem leads her life? Describe the sisters’ relationship with their parents. Do you see these bonds echoed in your own life, with your parents or children? Clem’s attitude towards dying is always cavalier; she makes light of death and even describes it once as a “state of respite.” Do you agree with Ralph, that she “needed to be fearless,” that her fearlessness was a screen for fear? If so, what do you think she feared so deeply? Why do you think she is able to desire for her sister what she herself avoids-a family, a steady relationship, a certain kind of calm? Both Louisa and Clem have bodies that are marked-Louisa’s by illness, Clem’s by accidents. Describe their relationships to their bodies and their scars. How does their experience of illness and accident relate to their attitudes toward life and death? Why do you think Clem treasures her most dramatic scar? What role does Louisa’s cancer play in the story? Do you think it has any influence on Clem’s ultimate, fatal decision? At the end, Louisa acknowledges to Campbell that Clem was ill. Would Clem have agreed? Clem says of Tighty that he “will never see the talents he’s blessed with, only the ones that he yearns for.” Do you think this is true about Clem as well? If so, what are the talents she is blessed with, and which does she yearn for? Although the primary relationship in this story is the one between Louisa and Clem, their ties to many other rich and varied characters are essential as well-ties to family, friends, colleagues, as well as lovers and husbands. Which of those other relationships strike you as the most pivotal in each woman’s life? Think of the men with whom the two sisters become romantically aligned: Luke, Zip, Hugh, Ray, Jerry, R.B., Campbell, and others. What do these various relationships tell you about these women at different stages of their lives? Do Louisa and Clem, despite their insistence on how differently they approach men, share a certain confusion when it comes to sexual and romantic desire? What does “love” mean to each sister? Louisa yearns for children, yet she does not have them with either Hugh or Ray; in the end, she becomes a mother to her stepsons and godson. Clem doesn’t want children-or, perhaps, will not let herself want them. Lucy has a child who is taken from her and grows up as her sister’s son. May is, in an odd way, a mother figure to Tighty. Clem cannot help seeing the animals she works with as her dependents. Discuss the different facets of caretaking-parenting and otherwise-in this story. What do they say about families and familial responsibilities in the world at large? If you’ve read Glass’s first two novels, Three Junes and The Whole World Over, how do the families in this new story relate to the families she’s written about in the past? “Everyone seems to know who I am, and what I think, but me.” Clem’s statement suggests a divide from the world and the understanding she has about herself. Do you think others understand her well or not at all? How well does she understand herself? Do you think this statement could apply to the other characters as well? Which ones and why? What do you understand about Clem through her relationship with the outdoors and animals? Do you think, as Jerry suggests, that she’s “afraid of [her] animal self”? Do you think that Danny’s death is what pushes her over the edge? Why? Danny dies, ultimately, because of a congenital flaw in his heart, while Clem says about her own heart, “At my worst moments, I wonder if I know what a broken heart is-or a heart before it’s broken. Maybe broken is all I know.” What about love makes Clem feel broken and unable to be whole? After Danny’s death, she concludes that “the opposite of happiness isn’t unhappiness….It’s surrender.” What do you think about this idea? At the end, Louisa says that “no one belongs to us, and we belong to no one-not in that sense. This should free us, but it never quite does.” Discuss this idea and how it fits in the novel. In what ways do we belong to one another? Relate this statement to what Ray says about Clem: “Nothing and no one were indispensable.” Are Louisa and Ray saying the same thing or something different about what we can and can’t expect from the people in our lives?